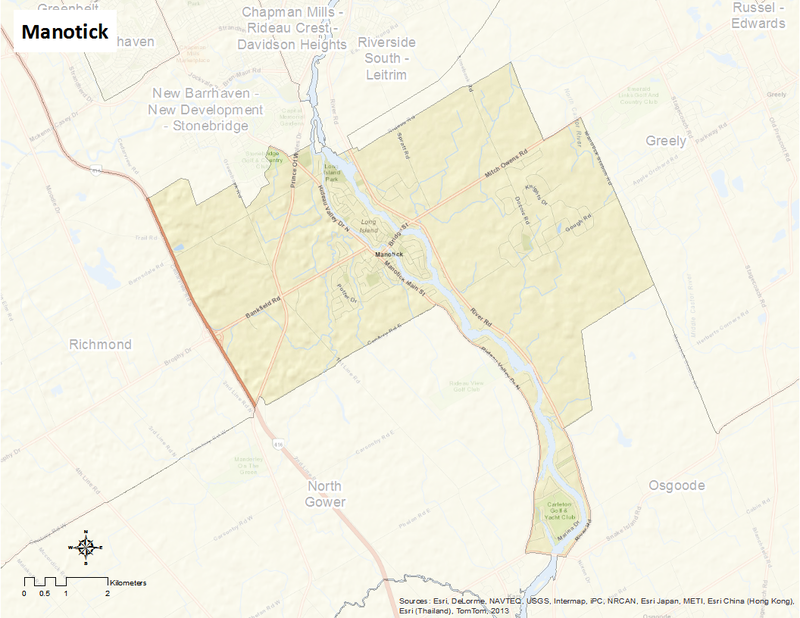 Manotick is bounded by both Bankfield Road and Mitch Owens Road on the north, and the Rideau River on the south. The eastern border is described by Highway 416, Third Line, Roger Stevens, First Line, Phelan, Flag Station, and Dozois Roads. The western border is described by Third Line, Carsonby, and McCordick Roads. The neighbourhood includes the communities of Manotick Village, Long Island, Colony Heights, and Mahogany. Manotick takes its name from an Ojibwa word meaning ’island in the river’. The Manotick area was first settled during the 1830s by Moss Kent Dickinson (who also named the community) and Joseph Merrill Currier for the primary purposes of logging, milling, and trading following the construction of the Rideau Canal. However, as the commercial importance of the Rideau Canal declined so did the town’s commercial significance. Today residents continue to celebrate the town’s early regard with a one day festival every June.